San Diego State University’s Television, Film, and New Media (TFM) program will present the Best of the Best Film Fest, a two-day film festival, on Sept. 13-14 at the Don Powell Theatre. The films are written, produced and edited by both current students and recent graduates. Featuring films from a variety of genres, including documentaries, comedies and dramatic fiction, the festival showcases the range of creative and practical skills the students bring to their films. Students in film and theatre are encouraged to go to the Best of the Best Film Fest not just to see and support their peers’ work, but to see excellence in student filmmaking. These experiences set the bar of the high level of work being done at SDSU. The TFM Program started working on developing an MFA program three years ago. The first class of fim MFA students graduated last spring. 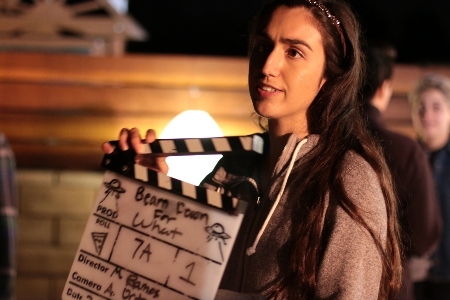 To be considered for inclusion at the Best of the Best Film Students, students must have made the film while enrolled at San Diego State University. Both graduate and undergraduate students are considered. Film students at San Diego State University own their own films, keeping all the rights for future distribution. By controlling the rights to the film, students have the opportunity to develop a festival strategy or a plan to distribute it for generating income. These entrepreneurial endeavors further educate film students about the industry. Student filmmakers work collaboratively to complete their films, with a key group who are responsible for creative decisions, including a writer/director, a producer, a production designer, a sound designer, and an editor. Films crews often grow to as many as twenty students on a single project. Before any filming begins, students are required to complete in-depth research about their film. In addition to researching the subject content, students must create a “look book” for the film. This includes desired color pallets, style sheets, and visual concepts of the lighting and scenic design. Students must also establish practical plan for the film, including a budget, and location scouting. “The collaborative dimension is a huge part of the process,” said Durbin. “The film students at SDSU really know to value their work in different craft areas such as editing, sounding design, or production design.” This emphasis on building professional skills facilitates a collaborative spirit in classes that allows students to work with and learn from each other. Both nights of the Best of the Best Film Fest run roughly 90 minutes, and each evening features a different collection of films. General admission tickets cost $10 and can be purchased online or at the Don Powell Theatre box office.